The remains of Etal Castle stand beside the River Till at the west end of the single street that runs through the remarkably pretty, if tiny, village of Etal, some eight miles north west of Wooler in Northumberland. You approach through the village, before passing to the left of the gatehouse along a lane that leads to a car park. The entrance is via the reception and exhibition area, in what was once a Presbyterian chapel. The exhibition housed within the old chapel is outstanding, and much of it revolves around the Battle of Flodden, fought just two and a half miles to the south west on 9 September 1513. King Henry VIII of England had invaded France earlier in 1513, and the Scottish felt obliged to invade England under the terms of the Auld Alliance, their mutual defence treaty with France. 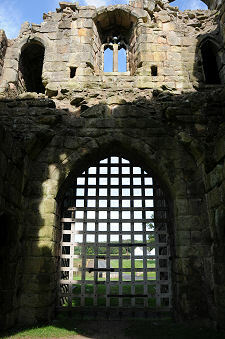 The Scots succeeded in capturing a number of English castles near the border, including Etal, before being confronted by a smaller English army under the Earl of Surrey. The outcome was a catastrophe for Scotland, and a triumph for England. The Scots lost up to 10,000 dead out of an army of some 25,000. The Scottish dead included King James IV himself, plus an archbishop, two bishops, 11 earls, 15 lords and 300 knights: in effect a whole generation of the Scottish nobility was swept away. The English lost just 1,700 dead out of an army of around 20,000. What made matters worse for the Scots was that the army that had beaten them was, in effect, the English "B" Team, hastily gathered while the main army was away in France. It is arguable that the outcome of Flodden fixed the course for future relations between England and Scotland up to the Act of Union of 1707. The exhibition at Etal gives a vivid impression of the forests of pikes deployed in conflict in the early 1500s, and there are also examples of other arms and armour, as well as a model showing the confrontation between the two armies, and a small cannon that looks likely to have been of greater danger to those standing behind it than to its intended targets. Other parts of the exhibition look at the story of the villages of Etal and Ford. From the exhibition you pass through to the castle itself. Your first sight of it can be slightly confusing, because, initially at least, the castle appears to consist simply of a tower house standing in the midst of a large grassy area. It takes a little while to realise that you are looking at what was, in its heyday, one corner of a roughly rectangular castle. The imposing gatehouse which remains so obvious from Etal village, and which you pass en route to the car park, forms the opposite corner of the castle, and there are remains of another rather smaller south west tower built onto the end of the old manse of the Presbyterian chapel. It is thought that there was a further tower defending the north east corner of the castle, but its presumed site has never been excavated. The length of curtain wall from the gatehouse to the south west tower still stands to a considerable height, but the other three lengths of wall needed to complete the castle have long since disappeared. Today it is possible to enter the shell of the tower house and see internal evidence of the three floors which once provided a hall and accommodation for the lord and his family. The gatehouse comes complete with a number of interesting features including guard rooms, plus a good view of the village. 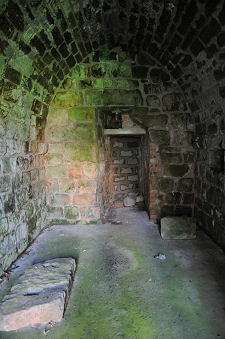 The south west tower exists only as a vaulted ground floor room. The history of Etal Castle dates back to the efforts of the Normans to secure their hold on northern England in the early 1100s. Northumberland was carved up into feudal baronies, each awarded to a supporter of Henry I. 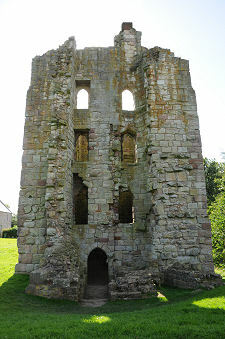 The Barony of Wooler was awarded in 1107 to Robert Muschamp, who must have had mixed views at being awarded one of the most dangerous places in England. Not only did he have the native Anglo-Saxons to gain and maintain control over, but there was also the ever present danger of Scottish incursions over the nearby border. Muschamp would have arrived in Wooler accompanied by a group of trusted knights. His first step would have been to gain firm control of the barony, an area measuring almost 20 miles from east to west and nearly ten from north to south. He would then have parcelled up smaller areas of land, which were effectively sub-let to his supporters in return for their obligation to provide military service when needed. By 1180 the knight holding the land, or manor, around Etal was one Robert Manners, and this remains the case in 1250, though it seems safe to assume that the Robert Manners referred to then was the son or grandson of the one holding the manor in 1180. The assumption is that the first Robert Manners would have lived in a timber hall set within an enclosure surrounded by a palisade. Another Robert Manners was knighted for services to King Edward I in 1278, and it seems very likely that the original wooden hall had been replaced by one built in stone by this time. In 1341, yet another Sir Robert Manners was awarded a licence to crenellate (or fortify) Etal. It seems that at this time a three storey stone tower house already existed on the site, and this was extended upwards by a further storey and crenellations added around the top. This would have been set within a courtyard defended by, probably, a wooden palisade. Sir Robert Manners died in 1354, and in a clear break with family tradition was succeeded by his son John Manners. After at least six generations of Robert Manners, it is tempting to wonder whether John was a younger son whose older brother (speculatively, a Robert) had died before inheriting. 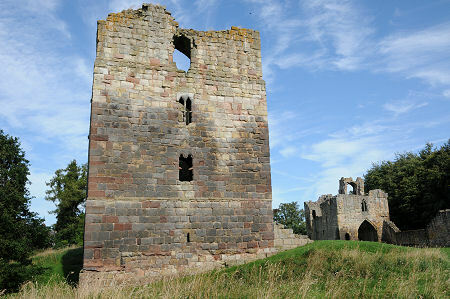 John Manners turned the tower house he inherited into Etal Castle, which appears to have been largely complete by 1368. The early 1400s were dominated by a feud between John Manners of Etal and the Heron family of Ford, less than two miles to the south east. This led to armed conflict in 1428 and the death of the heir to the Lord of Ford. By the time John Manners died (apparently of natural causes) in 1438, Etal Castle was dilapidated and the value of the manor had fallen to only a tenth of what it had been a century earlier. The Robert Manners who inherited in 1438 was knighted for his support for Henry de Percy, 3rd Baron Percy of Alnwick, and was later granted additional lands and estates. He also married well, ensuring that his son inherited the Lordship of Roos. This was good for the family, whose descendants became Earls and later Dukes of Rutland. It was less good for Etal Castle, which by the end of the 1400s was abandoned as a residence by the family in favour of the less troublesome surroundings of their estates in Rutland. Etal Castle was left in the care of a constable, John Collingwood, and it was during his tenure that the castle fell to a huge Scottish army in 1513. The castle was abandoned by the Scots after the Battle of Flodden and appears to have steadily declined in condition during the rest of the 1500s. The Etal estate passed through a number of hands over the following centuries, and it seems the tower house may have been in use as a residence for at least part of this time. It was abandoned for good when Etal Manor was built at the other end of the village in 1748. The Ford and Etal Estates were purchased by the 1st Baron Joicey of Chester le Street in 1907 and 1908, and he did much to restore the parts of the castle then still standing and turn the village into the attractive place it is today. 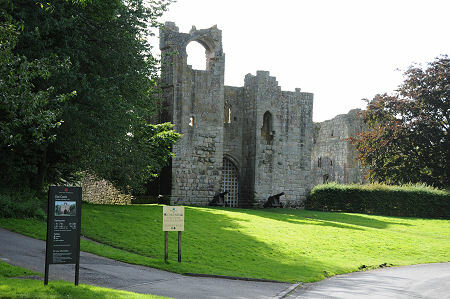 The Joicey family continue to own the Ford and Etal Estates, while Etal Castle is in the care of English Heritage.